In the simplest sense, electromagnetic radiation (emr) is any type of energy that meets two criteria. The first is that it can be thought of as a wave/particle. The second is that it travels at the speed of light. Sound is not emr. While it travels as a wave, it is a pressure wave which does not have the same consistent wavelength/frequency features that types of emr have. Secondly, sound waves are not energy. Lastly, it moves considerably slower than the speed of light. Visible light, infrared and ultraviolet light (both are invisible to humans), microwaves, X-rays, and gamma rays are also different types of emr. For a more extensive list, consult the electromagnetic spectrum under the "Tables" menu. The speed of light, 2.998 × 108 m/s, is remarkably fast for anything that takes place on Earth. However, when dealing with interplanetary distances, the speed of light can be used to show how far apart celestial objects are. Let's say you decide to call a friend (cell to cell) who lives 10 miles away. The waves will require 5.366 × 10-5 s to travel between the phones. To put this in perspective, your eyes take no faster than 150 ms (1.50 × 10-3 s) to blink. The cell phone waves are traveling roughly 350 times faster than this. Maybe you will have a friend who lives on Pluto one day. How long would it take cell phone waves to reach Pluto? The mean distance between Pluto and Earth is 5.666 × 1012 m. If you divide this distance by the speed of light you will find that it takes 18894 s, or 5 h 14 m 54 s for your words to reach your friend on Pluto. This means that upon pressing the "Send" button on your phone, it would take 5 h 14 m 54 s before your friend's phone began to ring. Consequently, when your friend answers and says "Hello" it will take another 5 h 14 m 54 s for the greeting carried on those cell waves to reach you back on Earth. 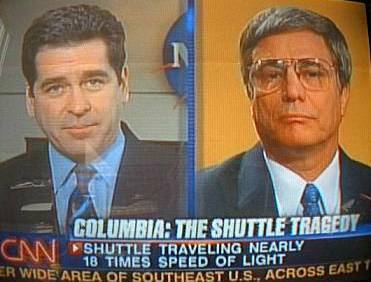 When reporting on the Columbia shuttle tragedy, CNN made the mistake of reporting that the shuttle was traveling nearly 18 times the speed of light. This is impossible as the speed of light is considered "the speed limit of the universe" and nothing can travel faster than light, or more appropriately, electromagnetic radiation. 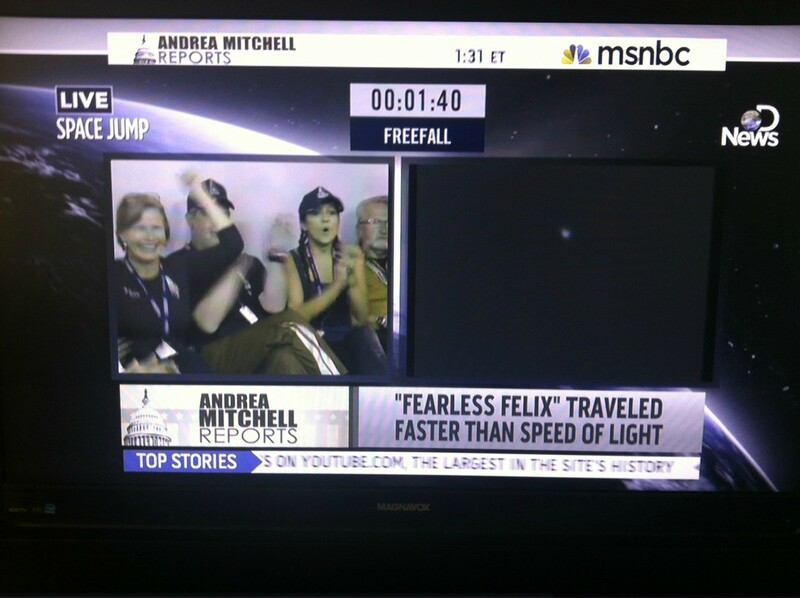 Making a similar gaffe when reporting on Felix Baumgartner's 24 mile skydive from the edge of space, MSNBC's graphic reported that his freefall speed exceeded the speed of light rather than the speed of sound. The speed of light is the product of two important wave characteristics: wavelength and frequency. Wavelength is defined as the distance between the crests of two successive waves. Since wavelength is the "length of a wave", it is recorded in meters. Frequency measures the number of waves that would pass a stationary point in one second, and expressed as waves per second, or hertz (Hz), a unit named in honor of Heinrich Hertz. These two properties are inversely related, that is as one increases the other decreases. An inspection of the electromagnetic spectrum shows that radio waves have the longest wavelength and shortest frequency. Conversely, X-rays and gamma rays have the shortest wavelengths and largest frequencies. Among the colors of visible light, red has the longest wavelength/smallest frequency and violet has the shortest wavelength/largest frequency. The color of stars is important on two fronts. First, it can tell us a great deal about the chemical composition of the star. Secondly, the color of the star can tell us the approximate temperature of the star. The second point is actually more a function of the first, as will be explained later. Stars are essentially very hot balls of gas. When they are viewed through a diffraction grating the star's light is diffracted, or separated into its component wavelengths. Studies of individual gases have provided astronomers with information about the wavelength, intensity, and the number of lines of each color emitted by the gas. When stars are viewed in this same way, the components combined spectra will be seen. Since certain wavelengths are unique to certain gases, the presence of certain wavelengths can confirm the presence of a certain element. The color of a star can also give insight into its temperature. Let's say that a certain electron transition gives a wavelength of light that corresponds to yellow. Now let's say that the temperature of that star is increased. This will excite the electron to higher energy levels than before. As a result, when the electron returns to a lower energy level, a higher energy color (and shorter wavelength) will be seen. In conclusion, it can be said that stars that appear red have the lowest temperature whereas stars that appear violet have the highest temperature. Our sun (it's actually orange when viewed from above the atmosphere) is a cooler star, checking in at a modest 5000 or 6000 degrees Celsius. Violet stars are perhaps four times hotter. Aurora is a generic term for the ribbon-like colored lights that are often seen near Earth's poles. Solar winds blow a great deal of radiation towards Earth. These particles (recall that alpha and beta particles are charged) congregate near the Earth's poles due to their magnetic field. As they hit atoms in a region of the atmosphere called the Van Allen belt, electrons are ejected from atoms. When these electrons collide (and join) a new atom, photons of light are emitted. The high concentration of oxygen and nitrogen in the atmosphere, in conjunction with the energy of the electrons, generally produce red or green colored lights. 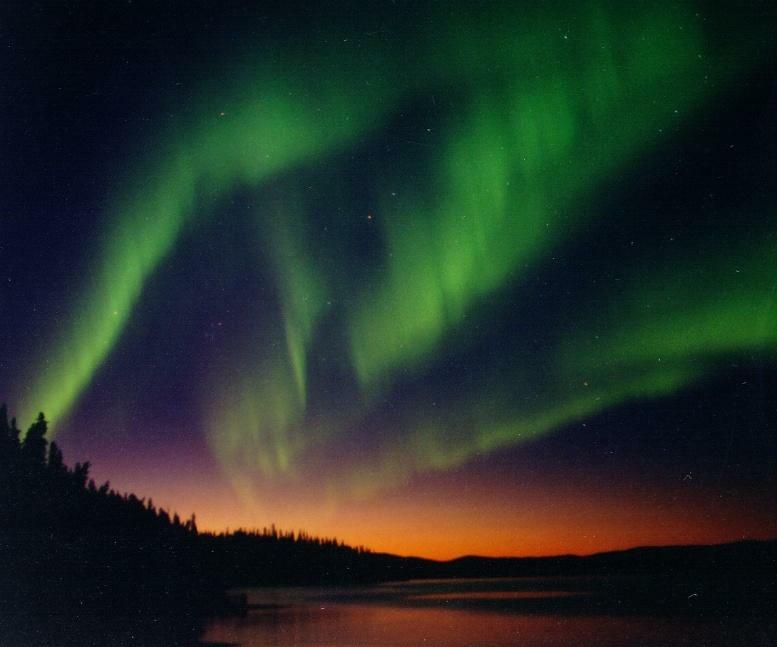 When seen in the northern atmosphere, this is referred to as aurora borealis (northern lights). In the southern hemisphere, the term aurora australis (southern lights) is used.